An exploitation film that struggles under the weight of its own ridiculousness. Made for robert Rodriguez fanboys, and people who can get past the fact that Jessica Alba is dreadfully boring in it. Ex-Federale Machete (Danny Trejo) chops, shoots, stabs, and eviscerates his way through countless bad guys in his self-titled picture. Robert Rodriguez pumps up the gore to maximum volume as gallons of CGI blood and severed body parts fly around on screen like they were confetti. It’s all well and good, until Machete actually tries to carry out a plot, then things get messy and not in a good way. There are a lot of things going on in this movie, and a convoluted plot isn’t something that an exploitation film like Machete needs. Robert Rodriguez tries to do too much with his ultra-violent flick. It’s obvious he’s trying to make a comment about illegal immigration, but is this really the platform to do that with? Does it help anyone’s cause that Rodriguez shows countless Mexican immigrants taking up arms and killing people? Those were just a few thoughts running through my mind. As for the plot, Senator McLaughlin (Robert De Niro) is making it a point to be extremely hard on illegal immigrants. He even goes so far as to join a rag-tag band of militia border-keepers, led by Don Johnson, on joy rides to kill people crossing the border. Machete was a police officer in Mexico, until Steven Segal (yes, Steven Segal) killed his wife. Now he’s given that life up to become a day laborer in Texas. Machete is hired by a local government persona to kill Senator McLaughlin, and Machete obliges because of all the hateful rhetoric that’s come out of his mouth. Too bad it’s a set up and now everyone wants Machete dead. Problem is he’s very hard to kill. The plot isn’t done yet though, throw in terribly boring Jessica Alba as a immigration agent whose scenes are sleep-inducing, an angst-ridden Michelle Rodriguez who is leading a resistance of Mexican fighters, and a coked-out Lindsay Lohan, more or less, playing herself, and you’ve got a very mixed bag. On one level I liked Machete and its over-the-top gore, its silly references, and its spoof-like humor, but on the other hand when Machete isn’t hacking up henchmen the movie is dreadfully boring, bordering on tedious. Too much of the movie is focused on Alba’s cardboard character, and every time she’s on screen it’s hard to not wish that the movie would fast forward itself to the action scenes. Speaking of the action scenes, while funny at times, (like when Machete repels out of a building on the end of an enemy’s entrails) they’re poorly edited. Following much of the action is downright impossible especially during the last and great bloody battle that is reminiscent of the Anchorman newsroom fight scene, but with more gore and less tridents. Machete is, for the most part, what you expect it to be. It slices and dices with the best of them, but during its down moments the movie begins to drag. Going in you might expect Danny Trejo to chop people up for the entire runtime, but you’ll be surprised that Alba gets just as much screen time to bore you to death. 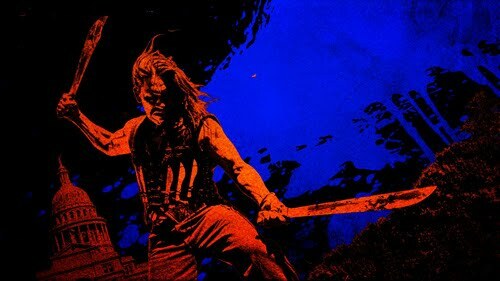 If I had to choose between Machete’s knife or Alba’s dialogue, I’d choose Machete’s knife any time.